The refugees are fleeing abduction, torture, and assault—that’s why they’ll continue trying to reach Europe any way they can. Just days after European Union ministers floated a proposal to rescue African migrants on the Mediterranean, the plan is already sinking amid a political impasse on the question of “sharing the burden” of the crisis. Meanwhile, thousands are facing death and torture on the perilous trail to Fortress Europe. The proposed measures include expanding joint search-and-rescue patrols, establishing resettlement quotas, and sending military forces to Libya to keep migrants as far away as possible. But France, Spain, and the United Kingdom have rejected the idea of quotas for distributing migrants across member countries. The UK cites national sovereignty issues. Spain claims its high unemployment rate makes it unethical to accept migrants (though Italy, Greece, and Malta, which currently absorb the bulk of migrants, face similar or heavier social strains). Yet keeping borders sealed won’t truly deter anyone, because across the sea in Libya, there are no quotas, and no limit to the misery people endure as they seek refuge. Some migrants had been long-term residents of Libya but were displaced by the ongoing civil conflict following the fall of the Gaddafi regime. African migrant workers have suffered especially severe abuse, fueled by an explosion of underlying racism and xenophobia, along with a lack of migrants’ legal rights. They would come steal our money and flog us. As a black man, I cannot go to complain to the police. I went to complain at the police station twice but they did not believe me. … They call us slaves. I am a Christian and that’s why the men would always come to our house and attack us. There were women from Tunisia, Gambia, Ghana, Cameroon, Somalia and Nigeria. They used to beat us with pipes on the back of our thighs; they were even beating the pregnant women. At night, they would come to our rooms and tried to sleep with us. … During the day, they would force us to come out of our rooms to clean or cook. They used to touch our breasts when we were working. They would beat us if we dared to shout. And those who manage to survive these abuses may still face a high risk of dying on a capsized fishing boat. And now yet another kind of brutality may await them on the coastline. Reflecting xenophobia roiling in their countries’ domestic politics, European officials are now considering military strikes to destroy smuggling vessels before they leave Libya. Activists and the Italian coastguard warn that the last thing refugees need is more bombing—especially not from the same countries that refugees would presumably want to petition for asylum. Amnesty International has called on the collapsed Libyan government to address these conditions by releasing people unjustly imprisoned and providing for detainees’ basic needs. Mughrabi also stresses that neighboring countries should keep their land borders open to “anyone fleeing persecution regardless of their nationality, regardless of whether or not they have travel documents.” More importantly, human-rights activists demand that the EU match the efforts of those (much poorer) countries with a comprehensive plan to accommodate refugees and migrants, including “resettlement places, humanitarian admissions and visas for people in need of international protection and [to] ensure that refugees have effective access to asylum at land borders,” so people do not have to resort to the trafficking routes. 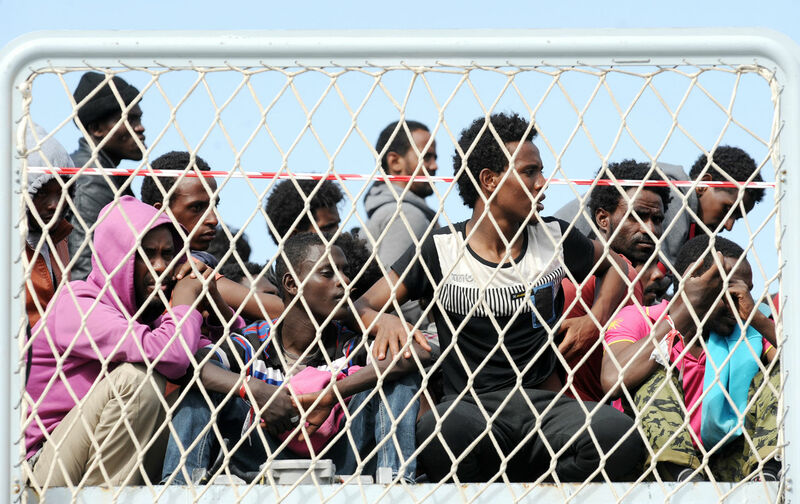 Instead of attacking the Libyan coast, border authorities should expand its severely underfunded search-and-rescue missions, which the EU cut last year in hopes that the prospect of mass death would deter them. It hasn’t, because too many migrants know they’ll face death wherever they turn—so they keep moving forward. The outcry over migrant deaths at sea reflects human-rights concerns that European governments are usually on the other side of. But the global inequality and instability that Europe helped instigate in the Global South couldn’t stay contained forever. Much of the Libyan crisis can actually be traced back to the 2011 military strikes that NATO claimed would give rise to a new democracy. Instead, it gave rise to a new humanitarian catastrophe. “The international community, especially the nations that took part in the NATO intervention…do have a responsibility towards addressing the situation in Libya [and accepting] the refugees and asylum seekers that this conflict has produced,” Mughrabi says.